Fantastic approach and route conditions. This is as good as it can get. Not to many bugs on the way in, but quite hot ascending to PCT. One small water source near PCT junction. Plenty of sources on the Foam Creek Trail. No issues crossing snow gullies or Foam Creek basin. Camped at toe of White Chuck to access water. Quite windy and everything froze both mornings even though day temps were high. If there is a perfect time to approach and climb, it's now. Gerdine is solid, but the Cool is showing a few cracks. 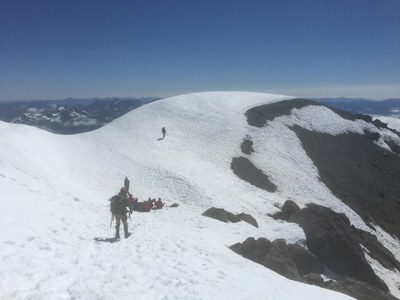 300ft of hard, steep booted snow to summit. There is significant rockfall coming off Disappointment Peak. Several appliances crossed out route between the up and down. I would not rope up here so as people can dodge hazards if they occur. Use your own judgement. After Glacier, we opted to go up the N side of Kololo via Suiattle Glacier. By the time we reached the Gap, only two felt good enough to tackle it. We opted not to as to keep the team together. The day was very hot, thus cramps and fatigue were setting in.